The MTA shot itself in the foot, and blamed its limp on its cast. It shuts down and reroutes trains with minimal notice, arbitrarily raises fares, provides handicap access at a (legally questionable) 20 percent of its stations, and shuts down stations for months at a time. Passengers suffer horrific wait times before the next train arrives, only to get packed in like sardines once one does pull into the station. 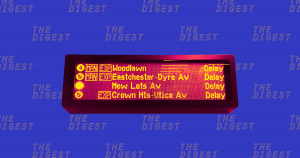 New Yorkers are all too familiar with the, er, quirks of the system we all need but love to hate, the New York City Metropolitan Transportation Authority (MTA). And now, after years of mismanagement, MTA has finally figured out why fewer people are taking the subway: those pesky ride-sharing apps. Yes, if the MTA is to be believed (which, have they ever lied to you before? ), the likes of Uber and Lyft are the culprits for New Yorkers’ waning enthusiasm for public transit. On Monday, in a presentation to MTA board members, New York City Transit Executive Vice President Tim Mulligan said the dip in subway and bus riders was actually caused by increased reliance on car-hailing apps, as The Wall Street Journal reported. So, is there any validity to this claim? The evidence reflects what every New Yorker knew while they were rolling their eyes through Mulligan’s quote: not so much. If the only reason that people took fewer train rides was because of Uber, which is still more expensive than the subway, then surely this would be a universal problem. But that’s not what the data suggests. In May, the Shared-Use Mobility Center (a non-profit that works to connect industry with transit agencies and communities that’s part of the National Academies of Science, Engineering and Medicine’s Transit Cooperative Research Program) concluded that ride-sharing apps were not killing public transit, as reported by Government Technology. Rather, people tended to call a car on weekends or late at night when public transit was less reliable or ran less frequently. And it wasn’t just New York. The researchers behind the report looked at data from Chicago, Washington D.C., Seattle, Los Angeles, Nashville, San Francisco, and the entire state of New Jersey. And while there were some dips in public transit usage across the nation, companies like Uber and Lyft were not to blame in any of those areas. No, the decline in MTA riders is more likely due to the fact that the trains are often unreliable — and many New Yorkers who live paycheck to paycheck can’t afford to take that risk at rush hour. It’s also possible that the people who rely on low-cost public transit can no longer afford to live in the areas where the subway is efficient or even useful. The MTA’s new stance of “We would be doing just fine if it wasn’t for Uber” goes beyond the MTA shooting itself in the foot — now it’s blaming its limp on its cast. It’s easy to point fingers at the MTA, tweet something sarcastic or bitter, and move on. But we should be concerned about how much we are using cars to replace public transit. And this information doesn’t mean you get to take your next Uber ride guilt-free. Each time a rider catches an Uber, Lyft, or any other ride-hailing company instead of using public transit, the public transportation infrastructure suffers. Sure, it’s a safe assumption that your $2.75 wouldn’t have fixed the NYC subway system, but it matters which passengers decide to call a car. As The Verge reported, private companies are incentivized to compete with public transit for wealthier customers who would take more popular routes. By siphoning people off the more lucrative bus or train lines, these cars are adding to street congestion during rush hour and are taking away the fares that help subsidize the less-lucrative but equally-crucial lines farther away from the city centers. Without the money from fares, the public transit system is unlikely to improve and could actually get worse. Of course, it’s not up to each individual rider to give up their comfort and convenience for the greater good. There are larger, institutional failings here. But all of those factors combined mean less money for public infrastructure, and an even lower chance that your train will get you to work on time. And, of course, it’s way harder for a particular subway car to turn away black passengers as many Uber, Lyft, and taxi drivers often do. So yes, the MTA is misplacing the blame for reduced use of public transit, but we shouldn’t be excited about the rising amount of cars-for-hire on the streets. And the sheer number of stations (and entire lines) MTA plans to close for months or years means it expects passengers to wait an awfully long time without checking to see how close the nearest Uber is. A “Smart” License Plate: To Buy or Not to Buy?